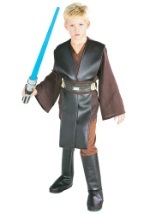 Get a fantastic Star Wars original trilogy Halloween costume with our deluxe child Stormtrooper costume. The kids Stormtrooper costume features a 100% polyester jumpsuit with white rubber armor pieces that are attached to the front of the costume. The jumpsuit has boot tops that are attached. Also included is a rubber belt and a white PVC helmet with eye, nose, and mouth openings for unobstructed view and easier breathing. The 2-piece helmet uses Velcro to attach the front to the back. Don this sleek deluxe child Stormtrooper costume and add a pair of white costume gloves for a great Star Wars Halloween costume.